In bowl, stir together all sauce ingredients. Heat wok or lg skillet over high heat. Add oil, coat bottom. Add chicken, stir-fry 4-5 min, remove chicken, keep warm. If needed add more oil to skillet or wok. Add onion, ginger and garlic, cook 30 seconds. Add carrots, broccoli, mushrooms, snow peas and bell pepper. 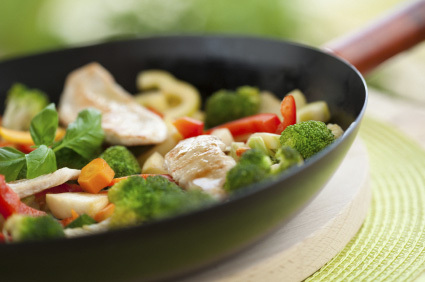 Stir-fry 1-2 minutes or until vegetables are crisp-tender. Return chicken to wok. Stir in sauce. Bring to boil, stirring constantly.